How many hours have you spent at work generating EFS-ready information disclosure statements? All that could change with IDS Generator. IDS Generator is a web-based tool that helps you fill out an IDS form quickly, accurately, and efficiently. 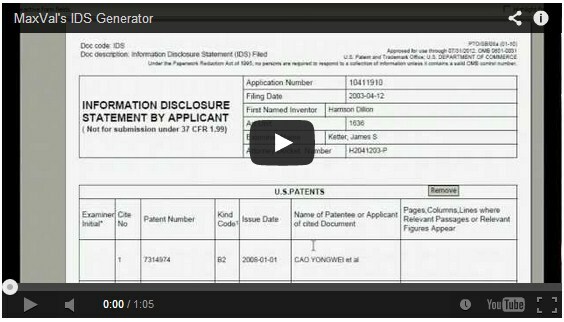 Simply enter patent or publication number(s) or copy and paste from a document (Word or Excel) and this amazing tool will generate a USPTO-approved EFS-ready document for you. The IDS generated using this tool will be emailed to the email id registered with Max-Insight. Please note that PTO's EFS ready IDS form has the following limit for references in one form. U.S. Patent citations and U.S. Published Applications - 300; Foreign – 50; and NPL – 50. Include name of the author (in CAPITAL LETTERS), title of the article (when appropriate), title of the item (book, magazine, journal, serial, symposium, catalog, etc), date, pages(s), volume-issue number(s), publisher, city and/or country where published. Please download the template from here and upload file after filling the appropriate field. Note: This tool requires Adobe Reader 8 or higher to open or edit the file generated.